I think "A Modern Way To Eat" by Anna Jones could be the most beautiful recipe book of all time. The style of it, the way it's put together and the photography are so spot on. I can happily just flick through this, staring dreamily at the images and drooling over the recipes. This is vegetarian cooking done in a simple, understandable and achievable way - there's very few obscure ingredients so most things can be picked up from a normal supermarket, you don't even need a Waitrose! I find this is really important for week night meals, I don't want to be trailing round Whole Foods on my lunch break, trying to locate some sort of obscure, expensive ingredient (Sumac, Nori, Coconut Sugar) just to put 1 tablespoon of it in my dinner! Even though this book has been included in my weekly Sunday morning recipe-book-reading-session for several months I realised last weekend that I've only made a handful of things from it. I decided this needed to change and picked every meal for this week from it. Because the quinoa is cooked with vegetable stock (be really careful of the salt quantities here, buy the reduced salt Kallo cubes if you can find them!) this meal has a really savoury flavour that's balanced nicely by the sharp feta, fresh herbs, sweet leeks and tangy lemon juice. 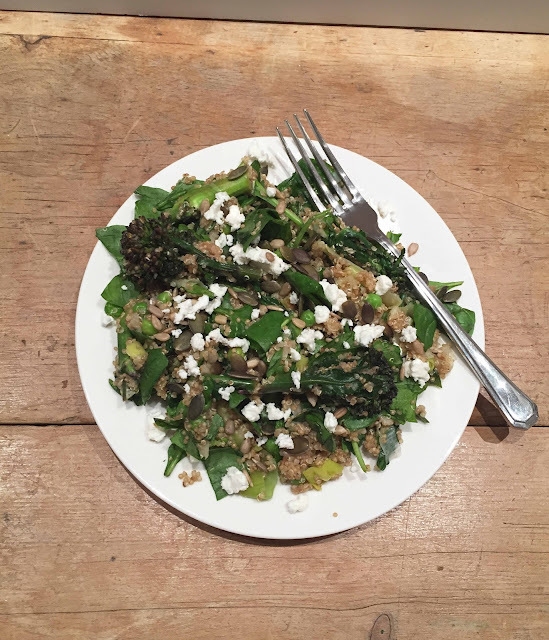 I find quinoa can sometimes be a bit underwhelming, a little bit...meh, because it doesn't have the nutty flavour or texture that brown rice has but because this recipe is full of good bits (broccoli, peas, softened leeks, spinach and feta) the qunioa really comes in to it's own. I completely love the crunchy seeds and lightly steamed broccoli, I think that's what made this so good. Not only does this look totally incredible on your plate, with all the different shades of green and the earthy purple from the sprouting broccoli, but it packs a huge nutritional punch. Quinoa is a complete protein, which means it gives our body amino acids that it can't create, so it's a good choice if you're not having meat. Broccoli and spinach are full of vitamins, minerals, and fiber, so your body will be thanking you after this dinner. I go to a Nutrition course at The College For Naturopathic Medicine for 2 hours every Tuesday night (which I absolutely love) so this was a perfect dinner to make on a Monday because it meant I could take the leftovers with me to eat during the lesson. It was also great for a Monday because it required no effort or thought, you just chuck a load of stuff together and it ends up being delicious and healthy! Don't you just love it when that happens? 1. To a medium sized pot, add the quinoa, veg stock and one of the lemons cut in half. Pour over 600ml of water, bring to the boil then reduce to simmer for about 15 minutes until most of the water has been absorbed. Place peas and broccoli on top of the quinoa, put a lid on and leave for 2-3 minutes until the broccoli has slightly softened. 2. Whilst this is happening, gently fry the sliced leek in olive oil over a low heat for about 10 minutes until reallt soft. 3. Drain quinoa and remove lemons. Leave to cool for a 5 minutes. 4. Squeeze the juice of the other lemon over quinoa. Add remaining ingredients apart from the feta. 5. 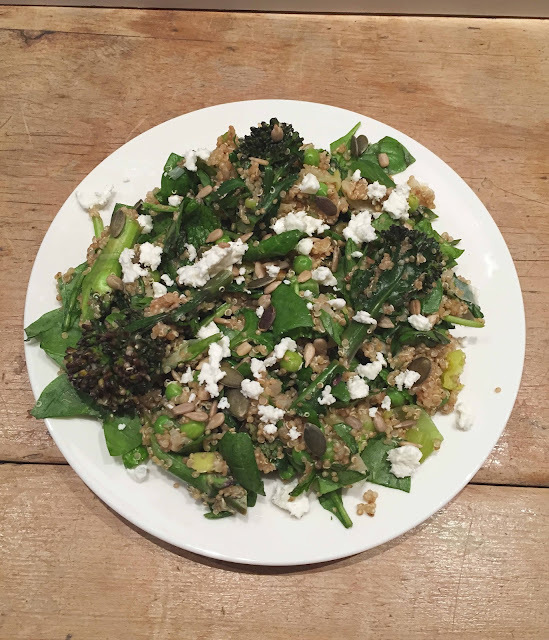 Put in to bowls and crumble feta on top. Omg, this looks delicious! 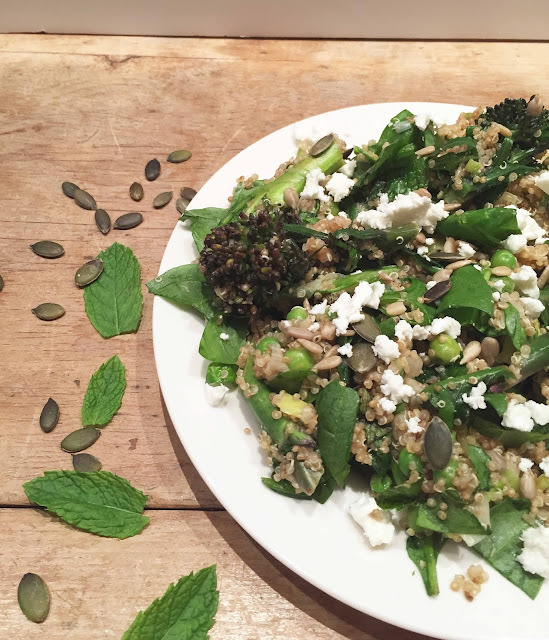 I don't eat feta but I'm sure I could substitute that with something else in this recipe! Looks really tasty and the best thing is it's so good for you! I've just posted a brownie recipe on my blog if you're interested? Little Green Fancy – New Lifestyle / Vegan Blog! Hi Chloe, I'm pleased you like the post :) I know, you're just eating a big plate of goodness! You could definitely substitute something for the feta, or leave it out and just add a bit more lemon juice and extra seeds. I'll pop over and have a look at that now! Mmm that looks delicious! It reminds me of the super food salad that Leon do, yum! Ooh I love Leon, I'm in love with their porridge!